Breather is a cyclically sweeping filter effect, useful for adding unpredictably swooshy noises to your compositions. • From 1 to 4 active variable-cutoff resonant filters offering 12dB/octave lowpass, highpass, bandpass, and notch modes	as well as a 24dB/octave lowpass mode. 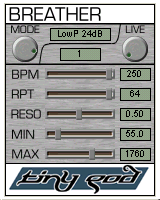 • Tempo selectable from 1 to 250 BPM. Filter frequency sweep range adjustable from 20Hz to 10KHz. • Filter sweep pattern repeats from 1 to 64 times, randomizing after the specified number of repeats. • Compact and straightforward custom GUI.